I'm sure many of us have experienced this: you go out to your barn in the morning to feed and your horse has a swollen, draining, painful eye. You march back up to your house and call your veterinarian, whose evaluation yields a diagnosis of a corneal ulcer. 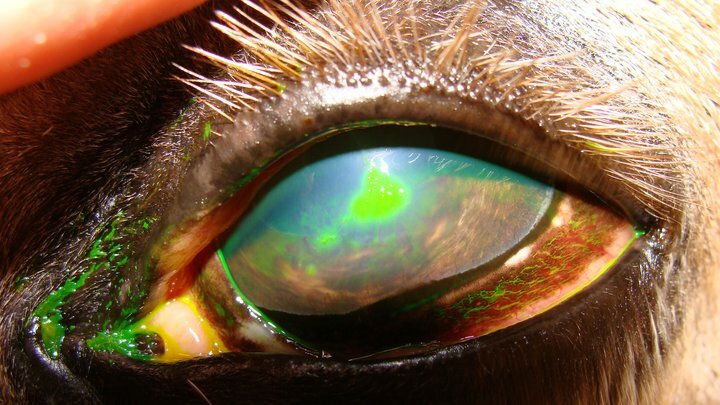 Corneal disease accounts for 1% of all disease in horses and almost 60% of all equine eye disease. That's quite a testament to how great horses are at catching their eye on a nail, broken board, or an object that you can never find no matter how hard you look. Corneal disease also occurs more commonly in humid weather. A healthy cornea is only about 1 millimeter thick so it doesn't take much to cause serious damage to the eye. Fortunately, the cornea is very efficient at healing. The lining of the cornea is made up of epithelium, similar to the surface of your skin. When this epithelium is disrupted, as it is with an ulcer, the edges of the cornea around the ulcer can slide across the defect at a rate of 1 millimeter per day. So a small corneal ulcer without any infection can heal very quickly. When your veterinarian arrives to see a horse with a possible ulcer, they will need to apply stain to the eye to diagnose it correctly. Fluorescein stain, as it is called, attaches to the disrupted corneal epithelium. An ulcer will show up as a neon yellow spot on the eye. Ulcers can range from very shallow and non-infected, to severely infected or even what we call a "melting ulcer". A simple non-infected ulcer can be treated with topical antibiotics, atropine to dilate the eye, and banamine for pain. Ulcers should not be treated with steroids (dexamethasone and prednisolone) because they decrease the body's immune response and allow infection to set in. Most small, uncomplicated ulcers should respond quickly to treatment and be completely resolved within a week to 10 days. A deep or infected ulcer will need to be treated as often as every hour and can be difficult to manage at home. When hospitalized, we can place what is called a subpalpebral lavage system in your horse's eye to medicate it more easily. This system is basically a catheter that is placed through the eyelid with long tubing to put medications in. It allows us to give medications as often as possible without having to pry the horse's eyelids open and apply medications directly. A more severe condition, called a melting ulcer, occurs when enzymes from bacteria or the body's inflammatory cells cause the cornea to breakdown and appear mushy. This is another case where a lavage system would be placed and the ulcer would be treated heavily with antibiotics and anti-enzymatic medications. Surgery is recommended with melting ulcers. A conjunctival graft (from the tissue surrounding the eyeball) can be stitched over the ulcerated area, allowing blood vessels to reach the affected cornea and promote faster healing. Another complicating factor with a corneal ulcer is fungal infection. Horses are prone to fungal infections, especially in warm, humid climates (like Indiana in the summer!). A typical fungal corneal ulcer does not respond to initial treatment with antibiotics and the horse will become more painful. 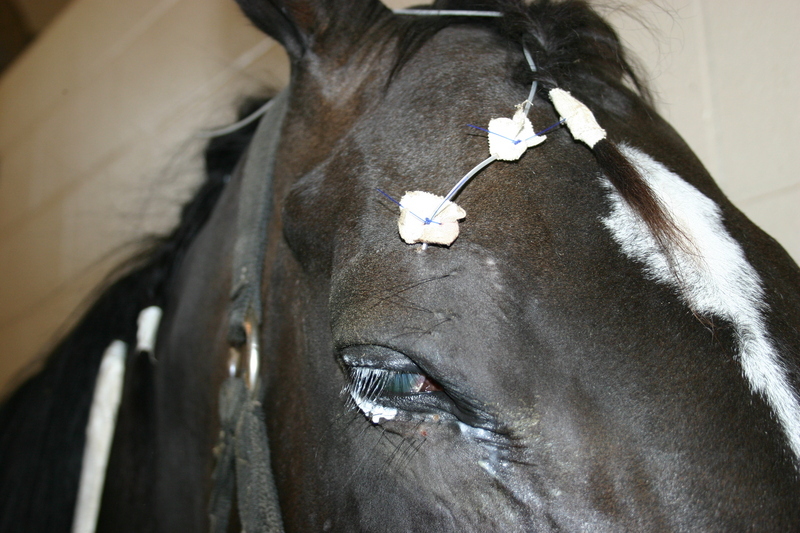 Trauma and chronic antibiotic and steroid treatment predispose a horse to fungal corneal infections. To properly treat this condition, a sample of the infected area must be taken and examined under a microscope to look for fungal particles. Treatment will be similar to that of an infected ulcer, with additional anti-fungal medications. Complete resolution can take months. In severe cases, surgery can be performed to remove the affected area of the cornea and transplant healthy cornea from a donor horse. If you are treating a horse with a corneal ulcer at home, some steps can be taken to help your success. Horses should be kept in a stall with low lighting and should not be turned out until the eye is no longer painful. Hay should be fed on the ground, not in hay racks, to prevent debris from getting in the eye. A fly mask can be used to protect the eye from trauma and flies. Depending on the severity of the ulceration, a scar will be present as a white opaque area on the cornea once healing is complete. Complications of corneal ulcers include eye rupture (if the ulcer is very deep), decreased vision, corneal scarring and pigmentation (darkening), and uveitis. Fortunately, the majority of equine corneal ulcers are mild and can easily be treated at home with regular application of antibiotics. If you are concerned about the health of your horse, please contact us at 877-499-9909.